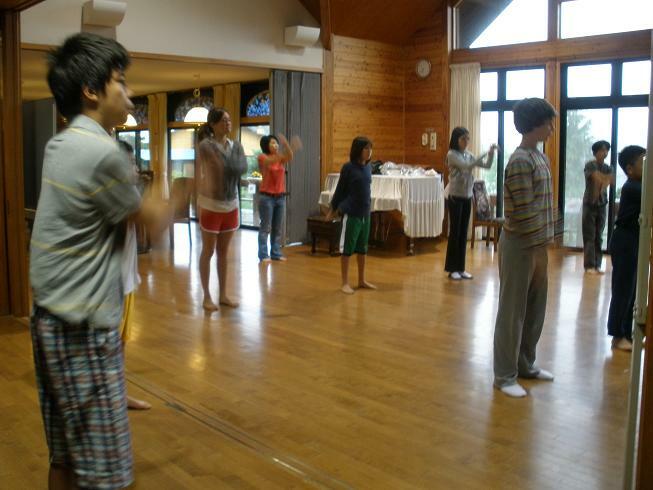 キャンプの初日！The First Day of Camp! 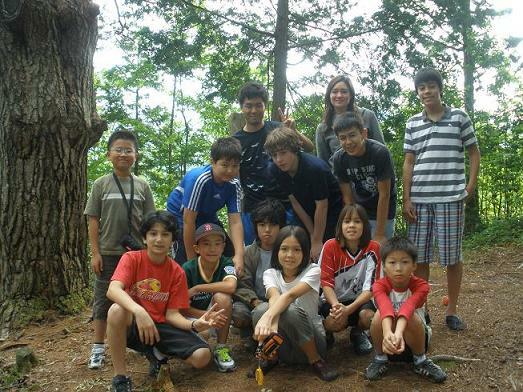 Campers from all around the world met today to attend Namiai camp (America, Egypt, France, Japan, Taiwan and Thailand). 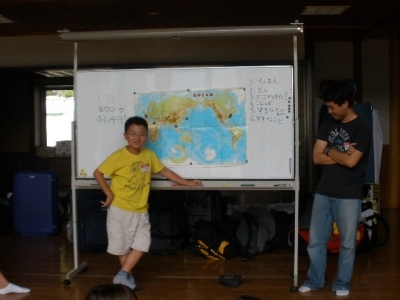 So many different cultures united by the Japanese language! 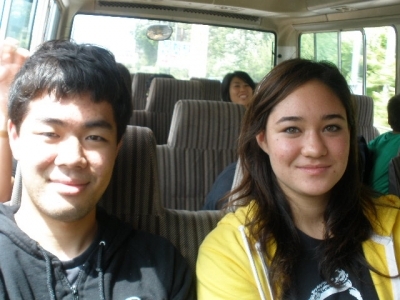 The day started off with good-byes to our parents and then a not-so-bad four-hour bus ride. We slept and entertained ourselves by catching up with old friends or introducing ourselves to the first time campers. Many appeared to be returning home when we pulled up to the beautiful log cabin overlooking the majestic hills. We spent a good deal of time getting to know each other by discussing name, age, country, languages, favorite foods, and hobbies. After getting settled and discussing the rules, we headed over to meet the center kids. They welcomed us with a song and we played a few games to get to know each other better. For dinner we had hayashi rice which was delicious ending to our tiring day. Everyone is very excited and looking forward to fun filled days ahead. For dinner we had hayashi rice which was delicious ending to our tiring day. Everyone is very excited and looking forward to fun filled days ahead. Today the camp went to a drinkable waterfall called “yuki no taki”. 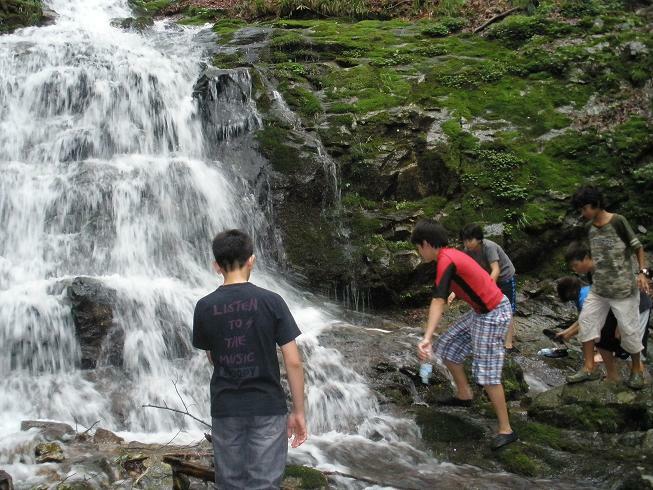 This waterfall is very beautiful and the water is drinkable, which made it fun for the camp to play in. After the waterfall we headed down to a Buddhist temple called “Gyou ou in”. When we entered the temple and a monk greeted us. 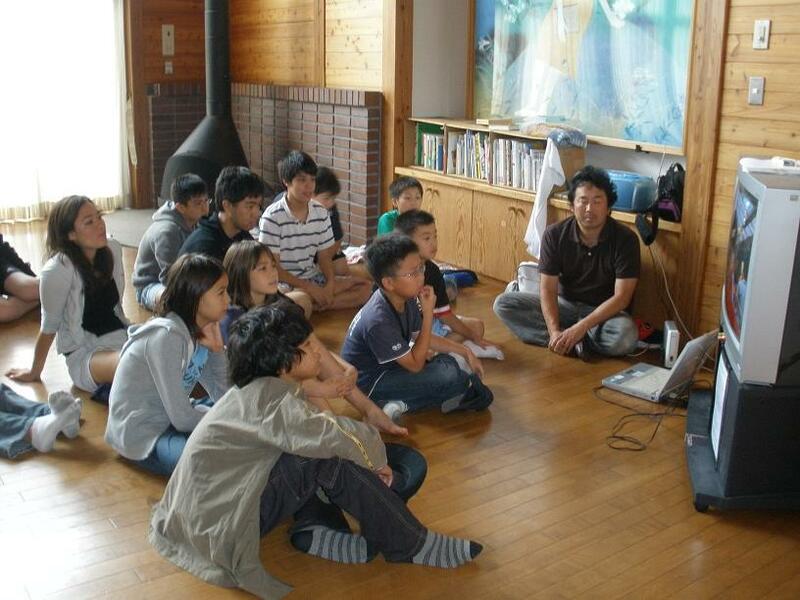 We first sat down and he gave us a lecture about Buddhism. Then we sang a shigin about September 10 and it was written by Sugawarano Michizane. The song was very unique and was very hard to sing. We sang the song a couple times and then meditated for fifteen minutes. After meditating we ate Japanese snacks and said good bye to the monk. 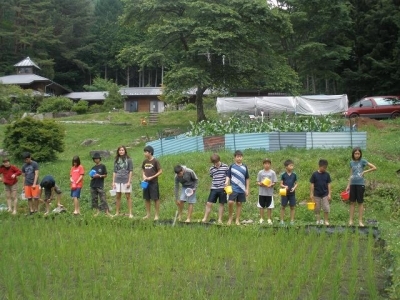 We then walked down to a field and played soccer with the local school kids. The pinnie team tied with the non-pinnie team, said good bye, and came home. Today was the second day of camp. We woke up at 6:20 and dressed, brushed our Teeth , and stretched for about five-ten minutes and cleaned up our mattresses, and got ready to eat breakfast. After breakfast we studied for an hour and a half. Then we had a little snack provided as a gift from one of the students. We studied for another hour and a half, and then it was recreation time. After recreation and then we wrote are goals and Turned it in. after writing our goals we had lunch. After lunch we went to visit a water fall, I got very wet. Then, we went to a Japanese temple and met a priest. 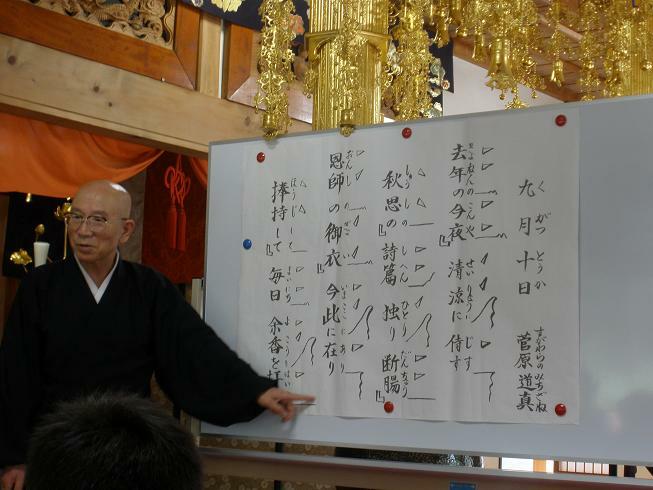 The priest gave us a lecture about Buddhism and then we sang a song, this song’s pitch went up and down a lot. We had a soccer game against the local and year-round students. Then we came home and ate dinner played a game and played an old Japanese instrument.We took our baths and got ready for bed. Today we ate breakfast and studied to accomplish our goals we set up yesterday. 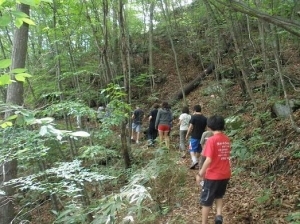 After lunch we walked up the mountain and went to the god pine tree (Kami no matsu). To go there we had to walk a sturdy walkway to the top. During the way there we took brilliant photos and at last we got to see the big tree. 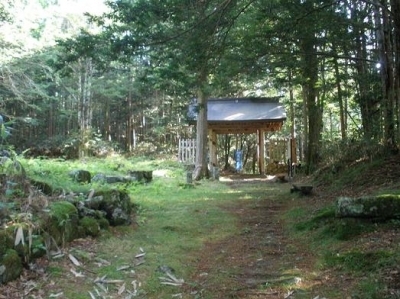 Next to it was a little hut and from there we saw great scenery. After going there we went inside and sew zoukin. The needle stung our fingers so for beginners it was hard. For dinner we ate at the center (one-year camp people). 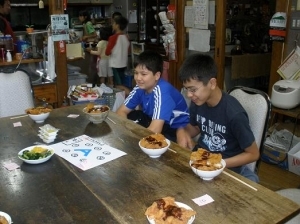 There we ate good tonkatsu and everyone loved it. The portion was too big so everyone couldn’t finish eating it. For dessert we had jello. The flavor was apple and was delicious. After that we put our plates away. After that we played a rock paper scissors game. Then we played a game where you had to pass around a ball in your group. We split into two groups and tried to get the fastest time. Group ones time was 1.07 seconds. And group two was 1.06 seconds so we were really close. Group one was sad because they lost. They only lost by one nanosecond do next time group one will try to get a better score. 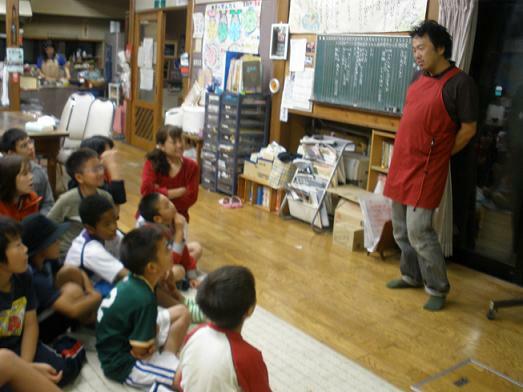 Today we received photography lessons from Kuzutetsu. We learned various techniques to take interesting pictures and we learned facts about digital cameras. For example many digital cameras have trouble screening the color purple. 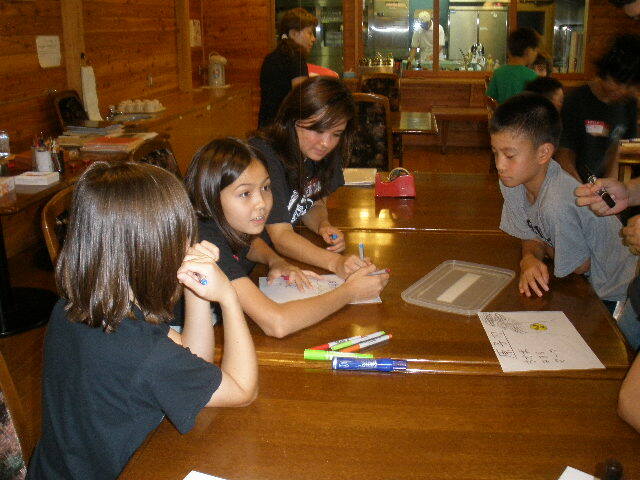 We enjoyed a few photo slide shows of the center students that were put together by Kuzutetsu. After that we went on a 3-kilometer hike in the village. We visited a beautiful shrine in the middle of the majestic woods and even saw wild monkeys! Many enjoyed the wildlife; we spotted frogs, giant grasshoppers, and beautiful flowers. We were able to use our newly obtained knowledge of photography to capture the scenery and hopefully take a picture worthy of winning the photo contest. 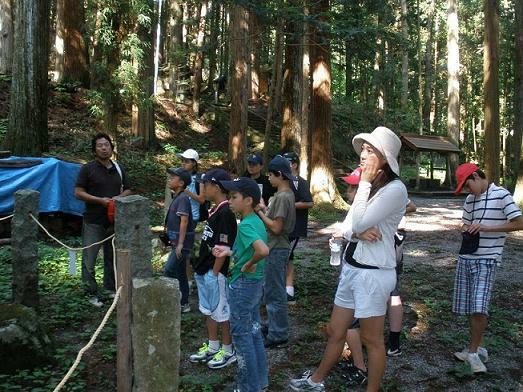 The highlight of the trip was the visit to the 350 year old checkpoint on the pathway that Takeda Shingen and his soldiers used to travel. It was a beautiful day without a single drop of rain! Today we hiked to the shrine. The shrine is a place to respect the god of traveling, Yukiyoshi Shinnou who died in a battle with his brother. 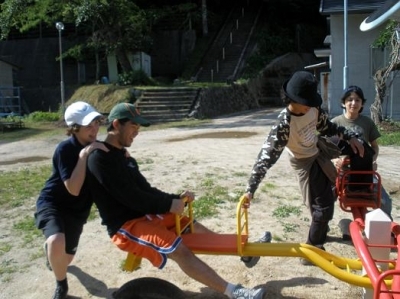 There was a memorial statue for Yukiyoshi Shinnou, and a long stairway to a school playground. 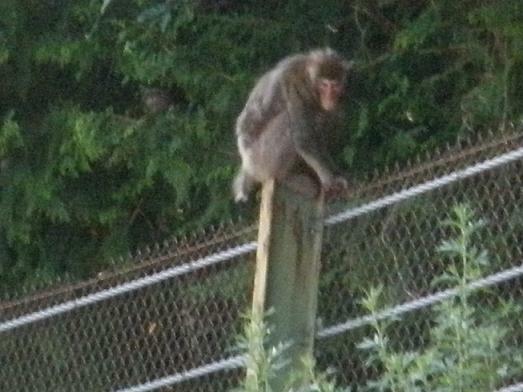 We saw a monkey on the fence and we took many pictures up close, while we were going back we noticed a grasshopper and took many pictures of it too. Today, we had three fun things to do. 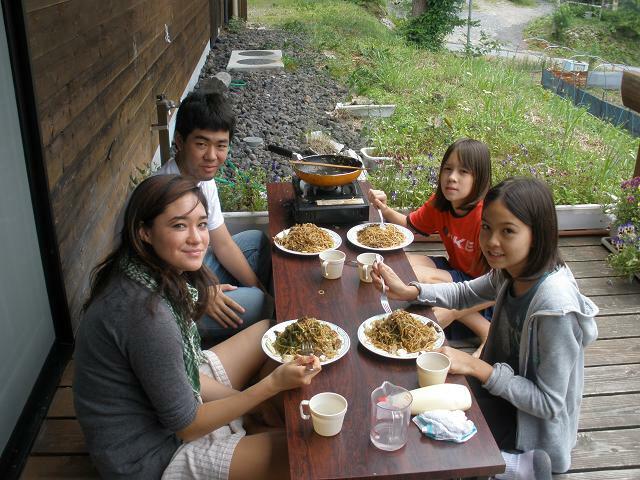 The first thing we did was making Yakisoba. The second one was removing grasses from the rice paddy. 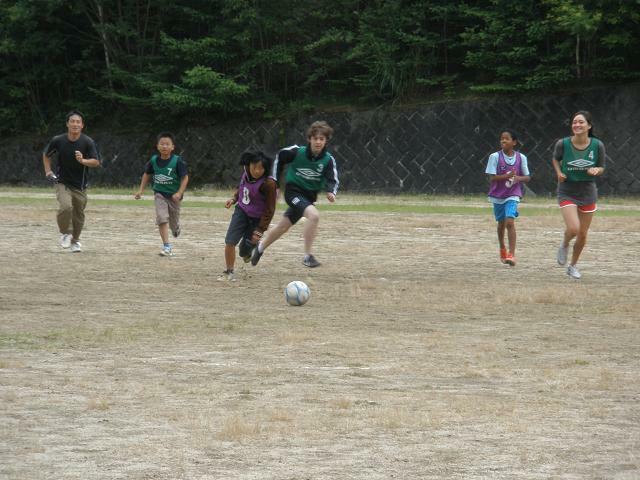 And last, we played Soccer with the Center kids. 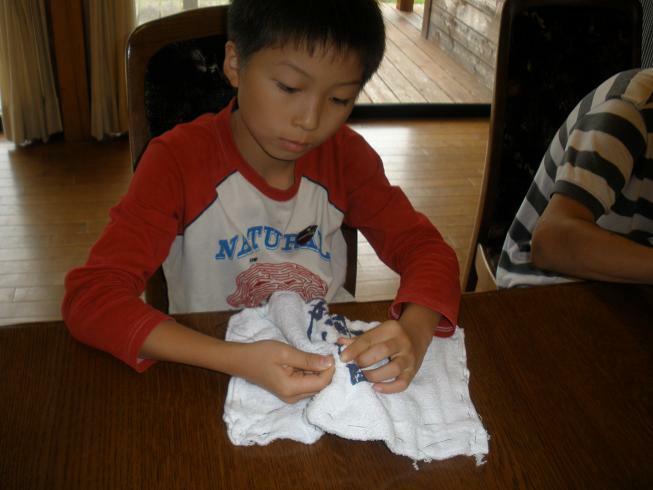 Before we even made the Yakisoba, we all learned how to cut and what the cut names were. 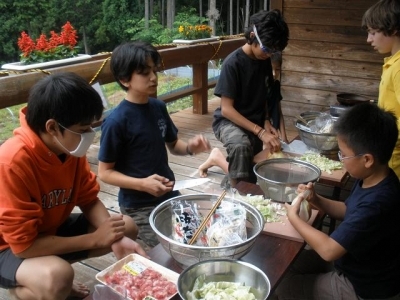 When our group was making the Yakisoba, I got so hungry! 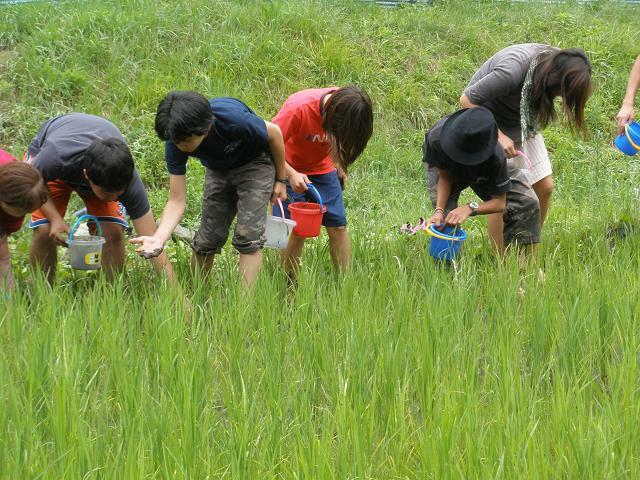 When it was about 1PM, we all went up to the road and into the Rice Paddy. First, there was no water at all! But then, one of the staffs came and put a lot of water in. When everyone got out, their foot was all black like ink. We got back to the Yugakukan and most of the people changed clothes. Moments later, two mini vans came and we were at the Namiai field. We had three different soccer matches going on. The first match was Center kids VS all of us. In the first half, the Center kids scored in two goals. In the second half, someone scored a goal. Then, at the very last second of the game, Adrian passed the ball and Karim got the ball and shot it. The ball went right in the goal! The game was tied 2-2. The next game was a mix game. It was some center kids + some kids from this camp. The first half was orange and purple piney Vs shirts team. The piney team won 3-0. The second half was 0-2. The total score was 3 for the pineys and 2 for the shirts. Today was the funniest day of Namiai camp 09.